See the jar to your left? That is what I think an oil jar should look like…battle-scarred, even abused. Having a good quality hot chili oil around the kitchen is fundamental. If you like your oil, you will use it in your food preparations and garnishes, if you don’t like your oil, you will blow it off. As well you should. To my taste, the oils available commercially are uninspiring. They are either way too hot (and lacking in flavor) or they are simply too one dimensional; they have chili, but nothing else. The chili oil that we use around the house is loosely based off of the Sichuan way of doing business. For those of you not familiar with the cuisine, the Sichuan Province of China is host to intensely hot, deeply complex, pork and duck-infested, oil- and chili-fueled foods. I was surprised, when I started experimenting with this cuisine how unprepared I was to handle the crushing onslaught of heat and spice involved. After all, I eat some really highly spiced Thai and Southwest foods; thought I was a fire eater. I was wrong. These Sichuan cooks mean business. If you are looking for a good guide to this cuisine, you can not go wrong with Land of Plenty: A Treasury of Authentic Sichuan Cooking by Fuchsia Dunlop. Oddly, the chili oil that forms the foundation of some of these dishes is sometimes the least incendiary part of the equation. It is rich, smooth and often carries deep undertones of flavor. Its role in the dish seems to be to carry complexity and depth of the spice profile; if you need heat, there are other more blunt tools available. The following recipe represents our current personal flavor profile. We built it to suit the foods that we prepare in-house. Once you have the basics down, build the oil that fits with the foods you cook. If you blow it, recycle the oil and try again. I would be highly surprised if my hot oil is the same two years from now. It needs to evolve to match your cooking. I think that there are some cautionary notes that need to be mentioned here. The first time I prepared this type of oil about 22 years ago, it was remarkable. Remarkable is another way to say that I had to evacuate the small kitchen area in my Kirkland, Washington apartment for many hours, having been driven from the field with something close to respiratory failure. I didn’t get treated for chemical pneumonia, but it felt like I should have. If you have ventilation, balcony, or windows, use it all. Similarly, this recipe relies on you adding very hot oil to glass; use a good quality canning glass or lab grade (like pyrex) for this and always make sure it is dry. I have not had the glass fail yet, but I do expect that it will happen some day. Remove from heat and add ginger. Allow to sizzle briefly (seconds). 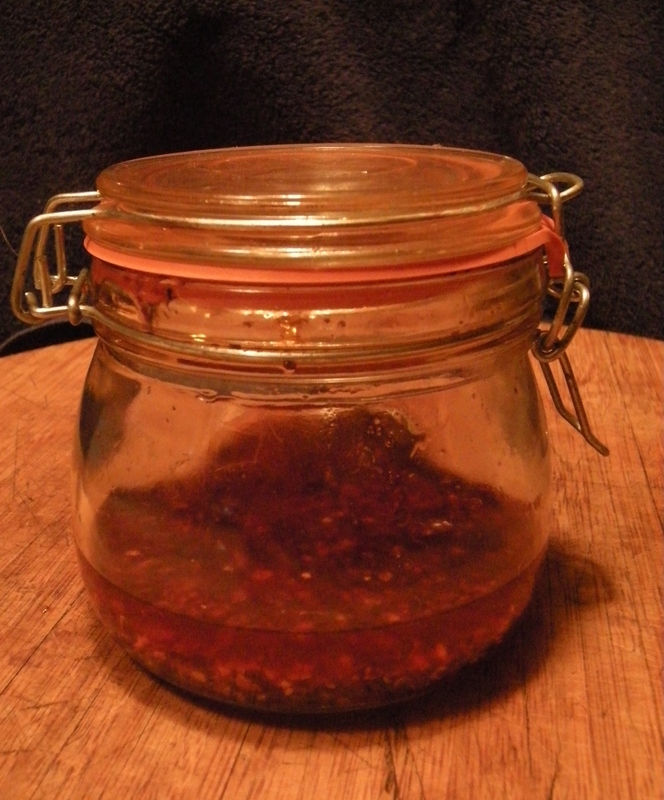 Pour infused oil into jar with remaining ingredients and stir two to three times. Allow to cool and cap.